FIV in Cats Controversy - Contagious or Not? FIV in Cats Controversy – Contagious or Not? 1. FIV is a retrovirus. Retroviruses are made up of RNA, and they work by transcribing into DNA in a host, thereby changing (infecting) all the host’s DNA. Retroviruses are species-specific, meaning the feline version of the virus cannot infect humans, and vice-versa. 2. FIV in cats presents in three stages, identical to the human form of the virus, and with similar symptoms. Common sick cat symptoms include fever, swollen lymph nodes, infection, loss of appetite, weight loss and lethargy, and more. 3. FIV’s symptoms may, at times, seem to mimic feline leukemia symptoms, but it is not transmitted by close contact, as is feline leukemia. 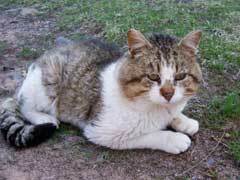 FIV is mainly spread through bite wounds, as it is shed in the saliva. For this reason, the majority of infected cats are outdoor, or feral, cats. It is very rare that a cat who is infected before she gets pregnant transmits the disease to her kittens either in pregnancy or through breast-feeding, although it can happen if she becomes infected while pregnant. 4. All cats should be tested for FIV, and retested any time they’re sick with infection, adopted into a new home, or exposed to other infected cats. Remember that it takes eight to twelve weeks after infection to be able to detect the antibodies, so re-test any cat who was possibly exposed to FIV again after twelve weeks have lapsed. As you can see, FIV in cats is actually a feline version of the human immunodeficiency virus. However, because it is a retrovirus, it is impossible for a cat to transmit it to a human. Nor can cats transmit it to each other just through simple contact. Although the health effects are far-reaching and progressive, it is possible for a cat infected with FIV to live a relatively full life with the proper care. Cat health insurance should cover the medications and treatments necessary to sustain the well-being of an FIV-infected cat.